An east-west trunk highway traveling three miles between CTH-EB (Packerland Drive) and STH-32 (Ashland Avenue), County VK joins Interstate 41 [U.S. 41] with Lambeau Field (home of the Green Bay Packers). The route carries two lanes along Hazelwood Lane through residential areas of MacArthur Heights and four to six lanes along Lombardi Avenue and the Ashwaubenon village line to Wis 32 at Olde Norwood in Green Bay. A roundabout was originally proposed for CTH-VK at Interstate 41 [U.S. 41]. The village of Ashwaubenon and the Green Bay Packers franchise opposed the rotary due to the difficulty of controlling roundabouts. Traffic signals there are manually controlled on game days to better manage traffic flow. Lombardi Avenue was originally a part of both U.S. 41 Business and Wis 32 as the two formed an L-shaped route with Ashland Avenue east from the U.S. 41 freeway through Ashwaubenon. U.S. 41 was eventually decommissioned and STH-32 shifted northward to Mason Street. 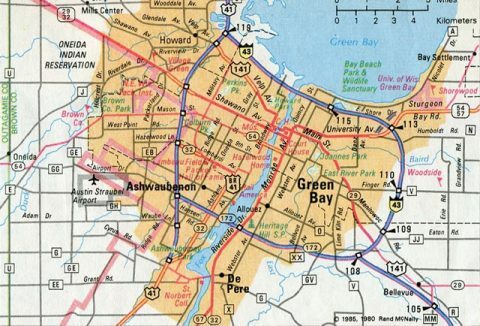 This 1985 inset of Green Bay shows the former U.S. 41 Business encircling Ashwaubenon and Wis 32 along Lombardi Avenue. Lambeau Field appears in the distance as County VK (Lombardi Avenue) intersects the south end of Military Avenue (historic U.S. 41) and Marlee Lane north. Photo taken 05/30/11. Approaching Ridge Road and Lambeau Field, CTH-VK runs along the north side of the Titletown District being developed in 2016. The site was formerly home to K-Mart and a motel among other businesses. Photo taken 05/30/11. Ridge Road lines the west side of Lambeau Field through Ashwaubenon while connecting County VK with the Lombardi neighborhood to the north. Photo taken 05/30/11. Home of the NFL Green Bay Packers, Lambeau Field opened in 1957. The venue remains named after its founder versus after a corporation or sponsor. Instead corporate naming rights were sold for the eight entrance gates. Photo taken 05/30/11. Lambeau Field opened initially with a capacity of 32,132. The stadium was expanded to 81,435 by 2014. Photo taken 05/30/11. Lombardi Avenue west becomes a part of County VK west from Wis 32 (Ashland Avenue). The avenue originates in an industrial area along the Fox River. Photo taken 02/23/16. Running west along the Lombardi neighborhood of Green Bay, CTH-VK (Lombardi Avenue) intersects Holmgren Way south and Gross Avenue north. Mike Holmgren was head coach of the Packers from 1992 to 1998. He led the team to a Super Bowl win in 1997. Photo taken 02/23/16. Continuing west, Lombardi Avenue passes by the Old Packers Hall of Fame. The hall moved to Lambeau Field, which appears in the distance. CTH-VH along this stretch also lines the walk of legends featuring statues of legends and history of the Green Bay Packers. Photo taken 02/23/16. County AAA stems south from County VK along Oneida Street between the Resch Center and Lambeau Field. CTH-AAA travels 4.1 miles south and west through Ashwaubenon to CTH-EB (Packerland Drive). Photo taken 02/23/16. County VK expands to six overall lanes after County AAA (Oneida Street). Photo taken 02/23/16. Looking south at the Lambeau Field Atrium from Lombardi Avenue westbound. Photo taken 02/23/16. Ridge Road runs along the west side of Lambeau Field. Photo taken 02/23/16. Westbound CTH-VK (Lombardi Avenue) at the Military Avenue split. Years ago when the road was U.S. 41, the road would curve to the right. Photo taken 02/23/16. Former K-Mart and other various buildings were cleared along the south side of County VK so the Packers could build the Titletown District. Construction runs through fall 2017. Photo taken 02/23/16. Marlee Lane north ties into the south end of Military Avenue at the next westbound traffic light along County VK. Military Avenue north serves the John Muir Park and Firemans Park neighborhoods of Green Bay. Photo taken 02/23/16. The intersection with Argonne Street was expanded to include full access with Lombardi Avenue to accommodate a new Cabellas store. CTH-VK west next meets Interstate 41. Photo taken 02/23/16. County VK expands to five westbound lanes as Lombardi Avenue enters the diamond interchange with Interstate 41 [U.S. 41]. Photo taken 02/23/16. Interstate 41 north heads north to Howard, where U.S. 41 takes over for the drive to Marinette and the UP of Michigan. I-41 south bisects Ashwaubenon en route to De Pere and Appleton. Photo taken 02/23/16. County VK becomes Hazelwood Lane after I-41. Wood Lane south from the MacArthur Heights neighborhood intersects the trunk highway opposite Shady Lane from Ashwaubenon. Photo taken 02/23/16. CTH-VK narrows to two lanes as it transitions into a residential through road. Photo taken 02/23/16. Approaching the intersection with CTH-EB (Packerland Drive) and the western terminus of CTH-VK within Oneida Indian Reservation. Photo taken 02/23/16. Packerland Drive (County EB) leads north through west Green Bay to an industrial area along the Howard village line and south to Wis 172 near Austin Straubel International Airport (GRB). Hazelwood Lane continues west as an unnumbered route one half mile to South Point Road. Photo taken 02/23/16. 05/30/11 by AARoads. 02/23/16 by Peter Johnson.